"It is very good at home. My heart was sad for leaving the scene of the big competition, the friendly Isle of Man. My feelings are mixed. I am tired. I need a few days of rest, before I continue trainings and working on the future. Now the most important for me is to be in calm and love with my family, Gabi and the dogs. On the flight, I was thinking about the next year TT. Now the things have to chill down. Thanks to everyone, who sponsored and supported me. It feels good, that so many are proud of me." Michael Dunlop brought it home, so after BMW won the main race of the Isle of Man after 1939. Sandor finished 41th, his last lap was his best this year at TT! 19:01.682 (118,9718 mph)! Race length is 364,38 km, which equals to 77 laps at Pannóniaring, or 83 laps on Hungaroring! "Today I received my medal for the Stock race. Everything is unsure for the next days. Tomorrow I can do only lpa for the Senior race, which looks to take place on Saturday due to weather. I don't want to stop riding. Normally I am surely faster, as I already proved this. My spouse, Gabi and I sacrificed everything for this TT. Except surviving the crash yesterday, everything was unlucky. I have no sponsor to continue. As I am at home, I must work on finding money for the races I can do this year, but yet the next year TT is in my mind. I don't know what will be, but I won't quit. I am sad but determined." Superstock race had to be postponed due to the weather. This was also won by Michael Dunlop with BMW, but this will not be remembered by this. Also not about the crash of previous day's Supersport race winner had a crash that resulted him the miss of the rest of the TT. But that three-times British Supersport champion Karl Harris suffered a fatal crash, right in front of Sandor. 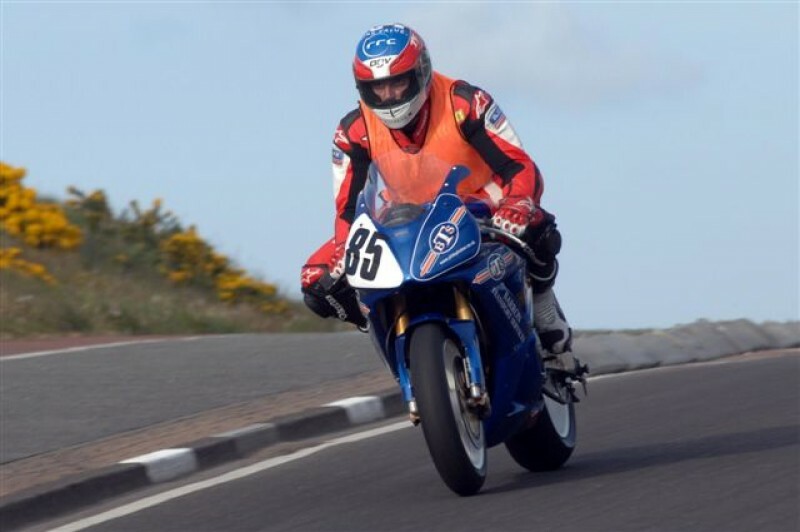 He is the second victim of this year's TT, after Bob Price died in previous day Supersport TT. The gearbox was replaced in Sandor's BMW. He finished 51th. Finally my bike was good. I don't know my result yet, just a bit later. An accident happened in front of me. I was lucky, as the flying debris nearly hit me. A front wheel just missed my head with only half metres! Due to the accidents, I could not do a fine lap. The accidnet shocked me, but I keep on attacking. My bike is really good, by the Senior race, I will be fast, finally. Over. The fatal accident of Karl Harris happened in front of me. The police will interrogate me, as I saw, what happened. I have to go to psychologist, even though I don't feel like I need to. Something hit my arm durind the accident. I send my deepest condolences to Karl's family and friends. As expected, the Superbike race was won by Michael Dunlop. His victory ended a long wait for the BMW. The solo races of the TT are usually dominated by Japanese bikes, there are rare triumphs for European brands. The trend for European bikes had the effect on Sandor as well - the gearbox failures from the practice week were present on this race, which caused Sandor to give up the race after two laps. Today's Superbike race has to be considered as a training for the next week's races. I did only 9 laps so far, and there was always something... These six laps will be really hard and exhausting. My pit limiter also does not work, which makes it even more difficult. My laptime was enough for the 72nd position. One or two years earlier it would have been good for the 45th... whatever. I am here, and I will do my best. I had to give up the race due to gearbox failure. Phisically, I was OK, I reached the rider in front of me, I had a good rhythm, but I could not shift back normally even in my first lap. Though I met a yellow flag, my first race lap was better than any of my qualifying laps. My second lap was terrible, from the finish straight I could go only in 6th gear, so I had to give up. That's it. It is neither my, nor the team's failure, but a big dose of unluck. I cannot find any words. I don't know, what the solution will be for the Monday race. I am over the first day of the training. I was getting familiar with the track and the bike. I had problems with the gearbox, I hope we can fix that today. Sometimes I could not shift to 4th gear. We also modify the shifter's position and have the bike tested on Dynojet. Today I will use the same gearbox like yesterday - if that does not work out, we will have to switch gearbox., or engine. The team is satisfied with my lap time, as this was only the first day, and I also not expected myself to be better, but I know I have to go faster. It is hard to get used to this high speed. The second practice is about to start. Luckily, the weather is really good. Yesterday a wrong part of the bike was replaced. The engine is 191 HP on Dyno, but the gearbox did not work fine - it switched from 4th gear three times, but now it is fixed. I got a sport tape for my arms, to help me avoiding tension in the muscles. Everyone was able to do one lap due to a red-flag triggering crash and the rain. Everything is very hard. I was on a bike only three times this year at Pannoniaring, and that was a 10-year-old, stock-like Honda. After these, organizer Paul Phillips told that my Tuesday's 19:39 is enough to qualify. I could do only five laps, while my newcomer teammate, BSB star Peter Hickman did 11. I did not have a single lap, where my gearbox would work fine. On the first day, from the beginning in the first lap, I lost my 4th gear when I wanted to shift up, plus I could not shift down. This was very dangerous. After the Sulby straight, where I have to shift back to 2nd after 6th fullgas, the bike remained in neutral gear, but I could barely turn in fifth. For Tuesday, we switched engine and I was optimistic. The fourth was OK, but shifting back was problematic. Before the 4 bend corner, and one of my favourite breaking point, I had to turn with empty gear, and in 2nd instead of 4th. I lose 20-30 seconds on every lap. I hope we fix this soon. This is very dangerous not just to me, but to the rider behind me, as well. I could not find a normal breaking point up to now... Yesterday my teammate fell, and he broke his femurs. I wish him fast recovery. My team chef, Shoey also cannot concentrate on his riding. He is much faster actually, than he could perform on the trainings. The team is great. The bike is strong enough, it is me who have to focus. Every day has some bad luck for me. Yesterday, in my first lap I was concentrating on the wet part of the track, as per suggested by Milky. And due to Laurent's crash, the first lap became the only. The zipper of my leathers opened in the fast part after Union Mills, and I had to finish my lap like that... Whatever. This is a giant event, and I cannot understand why we cannot find appropriate sponsors... today will be also hard, as our training starts at 20 o'clock. Track is still wet... tomorrow we will also start this late. My goal is to be 10-15 seconds faster than my best ever (18:48). We will see, what will be. I will do everything. Thanks to everyone, who helped me to compete, and the many support, of course. I am not satisfied with my lap time. Everything must fit. I would like to smile at last. I could not do it until now. Today was a hard day. A lot of packing, and making a huge tent and floor around our bus. After that, rider's registration and briefing, plus having our equipment confirmed. The bikes are not yet packed, but we are on it. The weather is terrible, around 11°C, and it rains all day. I would need to take at least two laps with car and analyze the onboard video of my friend Milky. I may reach my room at 10PM. I talked to a lot of good riders, I love this scene. I would like to be done with my first lap, and continue with this team after TT, but I have other opportunities, as well. I must consult with my sponsors at home, for I could ride at Southern 100, the Belgian round of IRRC at Chimay, the famous Ulster GP and Macau GP for little money. Now I have the fear, but that is natural, but it will be better. You can see photos from that day here.